As usual it is hard to crop Gaudi's work. 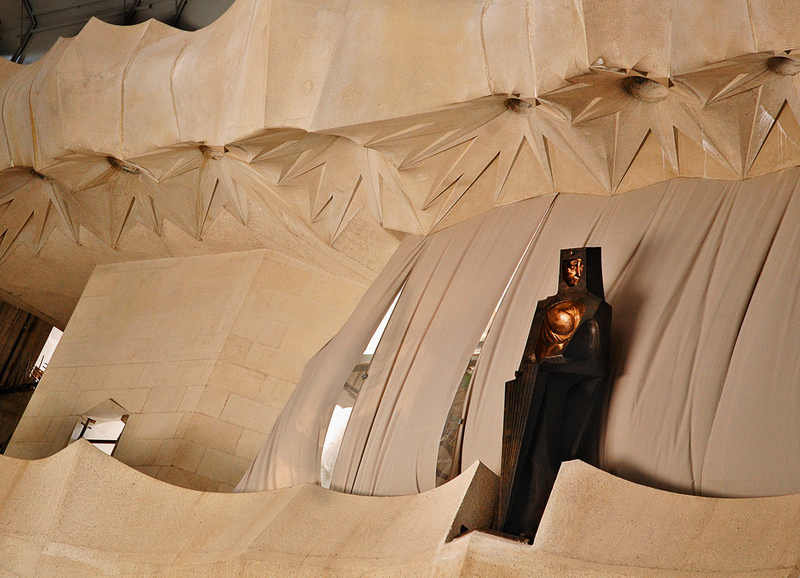 I spotted this weird modernist sculpture near the ceiling at Sagrada Familia. Unlike the ones outside this one is black. I suppose it is some kind of allusion to the Black Virgin called La Moreneta, the patroness of Catalonia but this is just a suggestion of mine. Muita bela ... quase que se fundem a pedra e os tecidos! também não conhecia o trabalho de Gaudi, depois da minha visita a Barcelona fiquei impressionado com aquele génio. Extraordinário o trabalho que ele desenvolveu pela cidade, terei em breve de voltar ai. when I need a place to sleep at in Barcelona, I always use hotelbarcelonas.com. It is quite good! Never let it leave your mind! Safety comes first.